EVENT DATE: Saturday, March 9, 10:00 a.m.–12:00 p.m.
Help us out on March 9 as we prep the Learning Garden for two forthcoming public events. We're going to organize some of the plants for the plant sale (March 16), clean up around the Chi Patio, and do survey of cutlery and plates and bowls for the Spring Equinox Celebration (March 23). We'll do some sprucing up of paths and entryway as well. Volunteers very welcome and needed! Our Time Bank members earn time credit!! 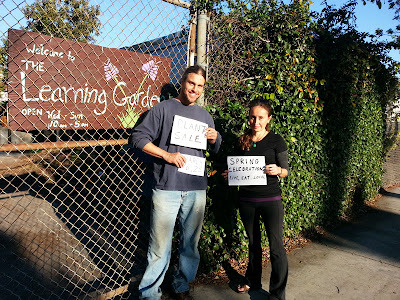 Read more about the March events at the Learning Garden in David King's blog.